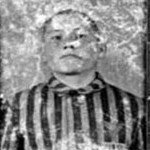 Thousands of prisoners passed the Auschwitz Gate twice every day. First time, early in the morning, when they were going to work and the second time, when they were coming back, often carried by friends because of extreme fatigue. 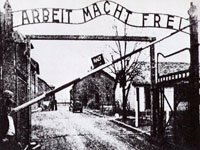 Every morning they glanced at the mocking sign “Arbeit Macht Frei” aware it could be there last time to pass this gate. Work which was said to liberate them, was in fact bringing a premature death. 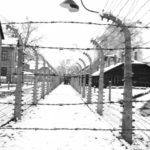 The Auschwitz gate never leaded to freedom – only to pain. 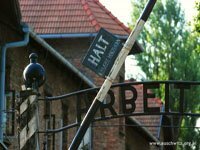 The ironic sign over the Auschwitz gate is another example of Nazi cruelty. 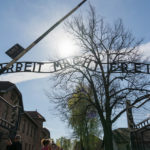 The words “Arbeit Macht Frei”, “Work Will Free You”, is a word play on the phrase taken from the Bible which says “Wahrheit macht frei” (Truth will free you). In early 30s the slogan “Arbeit Macht Frei” was very popular because of high unemployment level in Germany. 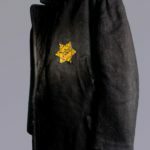 Later it became a favorite motto of Nazi officers who forced prisoners to work in inhuman conditions. The slogan appeared over the gates of many forced labor and extermination camps around the world. 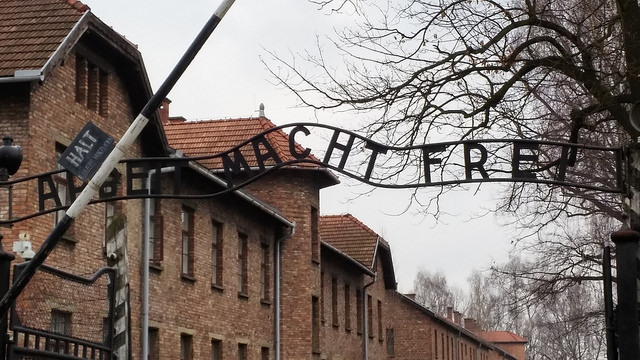 The sign over Auschwitz gate had been designed by the camp’s iron-worker and mounted by prisoners themselves. In protest against the slogan, they turned the “B” letter upside down. 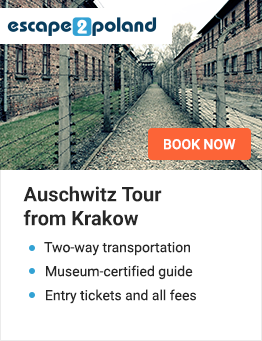 There was also an ironic rhyme about the slogan “Arbeit macht frei durch Krematorium Nummer drei” which means “Work will set you free through crematory number three”. 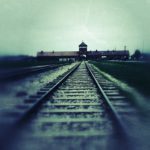 The gate of the Auschwitz Camp is still one of the best-known symbols of the holocaust. Nowadays there is only a copy of the famous sign. It replaced the original one after a shocking robbery. Fortunately, the police captured the thieves and brought the sign back. It had been divided into three parts. Criminals were paid to steal it by a Swedish neo-Nazi Andreas Hoegstroem. 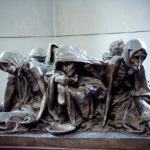 Now, the ringleader of this theft is waiting persecution in Krakow’s prison. 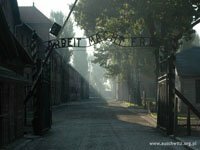 “Arbeit Macht Frei” over Auschwitz gate is one of the most recognizable symbols of the holocaust. It reminds us of Nazi cruelty and commemorates those who died in Auschwitz Concentration Camp.